As part of the South Side Works Sculpture Project the Industrial Arts Co-op (IAC) intends to commemorate the industrial steel heritage of Pittsburgh with the creation of a large public sculpture. With the sculpture as an addition to the landscape on the former Jones and Laughlin and LTV mill sites, visitors will be able to perceive the former activities of the area and the scope of the production of steel at the south side mills. 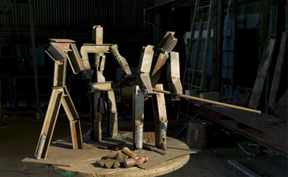 This site-specific sculpture will be comprised of two main elements: a relic of the steel industry and large figurative sculptures of steelworkers. The IAC has received a large (10'x8') hot metal ladle to serve as the most dominant and centrally located piece. The ladle will be presented in a way that it will safely demonstrate the scale and magnitude of working steel industry. Hot metal ladles were used at J&LSteel in the process of pouring molten pig iron into open-hearth and electric furnaces to make steel. Once the slag was separated from molten steel, the ladles were again used to pour steel into ingot molds. Ladles were and still are an essential tool in the transportation of molten metal, requiring extensive, overhead cranes and railroad cars to manipulate the material. 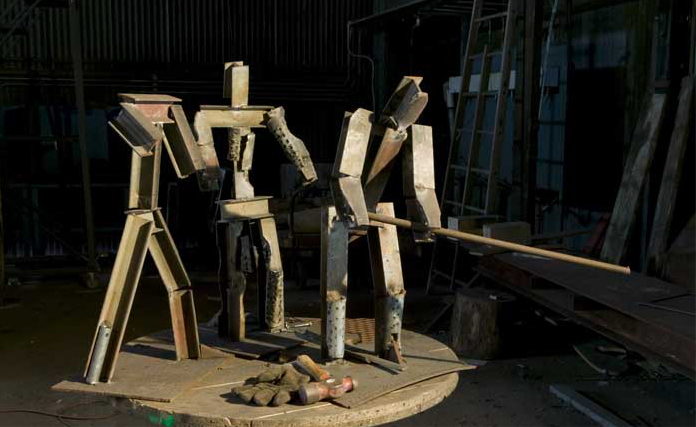 The second principle element of the site-specific sculpture will be the complimentary forms of larger than life, steelworker figures. The steelworker sculptures will be arranged around the ladle in a manner that shows the interaction between laborer and industry. The oversized (18'x6') steelworkers will be made from structural steel I beams that were once used in the construction of the Hot Metal Bridge, and other pieces of steel that have been recycled from the surrounding industrial landscape. The inclusion of these steelworker figures pays homage to the many generations and lives that were the work force behind the golden age of the steel industry.